With Thanksgiving right around the corner, we’re craving some of our favorite holiday dishes. 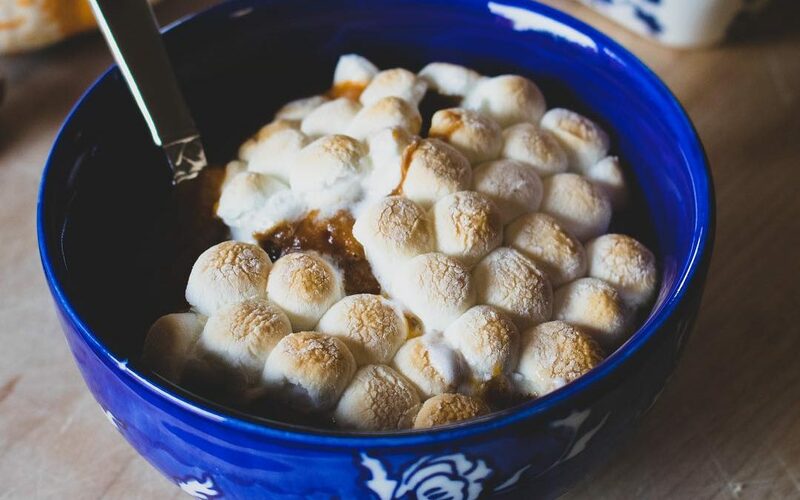 This recipe is a new twist on the traditional sweet potato casserole – with a rich and creamy Butternut and Sweet Potato base, crunchy, sticky candied pecans, and a thick layer of gooey marshmallows, this dish is sure to become a favorite! 1/2 cup packed brown sugar add more or less depending on how sweet you want the casserole! Preheat the oven to 375 F, and prepare a medium sized baking dish. While oven is preheating, prepare the pecan topping by heating a skillet over medium low heat. Toast the pecans until fragrant and warm, about 5 minutes, stirring frequently. Be careful that the pecans don't burn or brown! After toasted, add butter, maple syrup, sugar, and spices, stirring constantly to ensure none of the sticky mixture sticks to the pan. Once all the nuts are coated, remove from pan and let cool. Mix together Sweet Potato Puree, Butternut Puree, butter, cinnamon, brown sugar, and nutmeg until completely combined. Pour Sweet Potato and Butternut mixture into baking dish, and spread pecans evenly over the top of the mixture. Alternatively, mix them in with the mixture! Top the entire dish with marshmallows, and bake for 10 - 15 minutes checking every 2 minutes once the 10 minute mark has passed. Be careful as marshmallows can burn quickly. Let cool for 5 minutes, and serve immediately. Sign up for our newsletter for fresh recipes, tips and deals delivered right to your inbox!